Although less widely identified in the West, Okayama Wagyu (including the Fujiyoshi line) is perceived in Japan as one of the five most important sub-populations or genetic strains. (See Honda et al). However, in the evolution of modern Japanese beef production since the 1950s, breeding of important Okayama strain cattle has frequently taken place outside the prefecture. Nowhere is this more evident than in the case of the founding sire of the Modern (Shimane) Itozakura line, Dai 7 Itozakura, source of the most pervasive ‘growth’ Wagyu genetics in current Australian AI sires. With a name derived from the Japanese words for ‘hill’ (oka) and ‘mountain’ (yama) Okayama prides itself on the slogan: ‘The land of sunshine’. Located in south west Honshu, directly south of the Chugoku mountains which define its boundary with Tottori, the prefecture is a major logistics hub for trade by road, rail, sea and air. Prefecture capital Okayama city (pop. 700,000) lies on an inlet of Japan’s Seto Inland Sea about 75 minutes flying time or three and a quarter hours by bullet train from Tokyo. Okayama city sprawl has engulfed the traditional merchant/canal centre of Kurashiki city to give a combined metropolitan population of over 1.1 million – about 60% of the entire prefecture population, heavily concentrated on the coastal plain. Eighteen of a total 27 municipalities – mainly in the mountainous north and centre – are designated as depopulated. 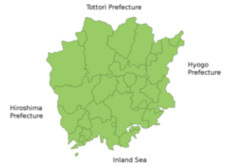 Like Tottori, much of the prefecture is forested (68%) and mountainous. The agricultural region makes up about 10% of land area. The prefecture symbol is a stylised peach, and peach blossom is the official prefectural flower. The agricultural economy of Okayama is substantially horticultural. Fertile plains along the coast of the Inland Sea support rice production but the prefecture is overwhelmingly recognized as the Fruit Bowl of Japan. The most famous product is peaches, with the shimuzu white peach acclaimed as the premium variety. About 55% of Japan’s peach production takes place in Okayama which is also home to one of Japan’s most famous fairy tales – appropriately: Momotaro, the Peach Boy. Muscat and pione grapes and melons are other major products. Small scale Wagyu production and forestry are dominant in the inland mountains. The Inland Sea provides an outstanding local fishery. As in Tottori, scenery is a major tourist appeal and seasonal mountain sports are popular in the northern mountain region, as are hot spas (onsen). Historically recognized as the ‘Kingdom of Kibi’, Okayama has a unique cultural history illustrated by numerous tombs, temples and shrines. One of Japan’s top three gardens and an outstanding castle may be visited in Okayama city. The prefecture is home to the ancient Bizen style of pottery and has a long history of textile production. For cultural heathens, an option is the AussieBar in Okayama city. A slight bias to Coopers indicates probable ownership by a crow eater. Like Tottori, at the centre of the Chugoku region, Okayama lies in the cradle of the Japanese Black, founded on native Mishima cattle. 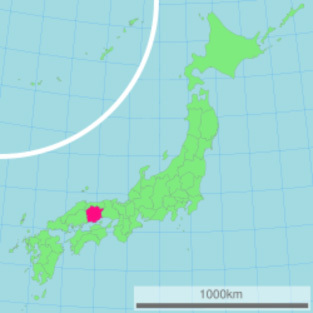 East is Hyogo prefecture, home of the Tajima strain; north (behind the mountains) is Tottori prefecture , west is Hiroshima prefecture. It is believed foundation stock for the Okayama genetic sub-population (strain) were imported from Tottori. The requirement was for beasts of burden (pack animals) to transport produce across a similarly difficult landscape. The famous innovation of Okayama Wagyu breeders was the development of Japan’s ‘tsuru’ inbreeding strategies, focused on trait fixing in female lines. The Takenotani-zuru was established about 250 years ago, leading to the development of superior cow families noted for large frames and good milking capabilities. These genetics can still be identified today. During the Government sponsored infusion of European genetics of the early Meiji Period in the 19th century, Wagyu in Okayama were influenced by the Shorthorn and Devon breeds. (See Minezawa, M.). This improved frame size, weight and milking ability. Superior pack animals were the result: the large-framed Okayama sire ‘Dai 13 Hanayama’ won the 9th Chugoku Wagyu competition in 1922. 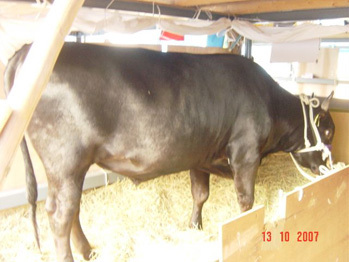 Dai 13 Haneyama was also identified as a high marbling sire and was procured by the Japanese Government agency MAFF as a foundation sire for national herd improvement. He died at 13 years of age having sired 780 progeny. The genetic legacy of this bull is available in Australia today in TF 147 Itoshigefuji, TF Itomichi ½ and others identified with growth. Through the second half of the 20th century, Okayama genetics became widely used in other prefectures, notably Shimane. Okayama genetic infusion targeted improvements such as frame size, primarily in cow herd development. One outcome of this genetic travel has been debate as to the prefectural ‘ownership’ of subsequent successful bloodlines (See Mr Shogo Takeda, ‘TF 147 genetics explained’, in Australian Wagyu UpDate, August 2007). There is no debate that the sire lines involved all descend from Dai 13 Hanayama. However, within the debate, some cattle descended from his progeny, Dai 6 Fujimori and Dai 7 Itozakura, were identified as a (modern) Fujiyoshi line; while Shimane Prefecture-bred Dai 7 Itozakura descendants became known as the (modern) Itozakura line. Much of the debate focused on the relative influences of sire and dam bloodline combinations. Today, widening divergences in progeny performance are identified by Mr Takeda to the extent that these should now be regarded as distinct modern bloodlines. Nonetheless, the Okayama origins are undeniable. Major Okayama-influenced bulls descended from the foundation sire Dai 13 Hanayama include “Dai 6 Kiyokuni” (Kiyokuni Line), Dai 4 Shimomae (Shimomae Line) and “Dai 6 Fujiyoshi” (Fujiyoshi Line). Combined Dai 13 Hanayama females with Hyogo (Tajima) sire infusion. Dai 6 Kiyokuni inherited Dai 13 Hanayama characteristics in good frame, good depth and marbling, while progeny demonstrated great consistency. Dai 4 Shimomae was unlike Dai 13 Hanayama, with a narrow hip and less length. Produced 3,893 progeny over five years including 53 bulls. “Dai 6 Fujimori” is the grand father of the most influential ‘growth’ sire in the background of the Australian herd, the famous “Dai 7 Itozakura”. Dai 7 Itozakura was born in Shimane Prefecture on 10 December 1970, being 25% Tajima, 50% Fujiyoshi and 25% Okayama. His sire, Dai 14 Shigeru, was born in Okayama. His dam, Dai 9 Itozakura (Sire: Shiro-Doi, Dam: Matsuyoshino) was an elite Tajima-strain cow descended from the Hyogo foundation sire, Tajiri. On the basis of this Shimane Prefecture breeding, Dai 7 Itozakaura represents a terminal stub on the (Okayama) Fujiyoshi pedigree tree; and the starting point of the Modern (Shimane) Itozakura line. Testing of the young sire revealed extraordinary daily gain, sustained in formal indirect progeny testing in 1975 (ADG 1.02kg), which also revealed well-maintained marbling. Owned by Shimane Prefecture, Dai 7 Itozakura led the Japanese Wagyu industry trend to ‘economically well-balanced’ production; combining growth and fertility with acceptable meat quality. He also sired many of the outstanding ‘economical production’ bulls of the current period, including Itofuji. Economical production is regarded as ever more important today. Dai 7 Itozakura died in 1982. 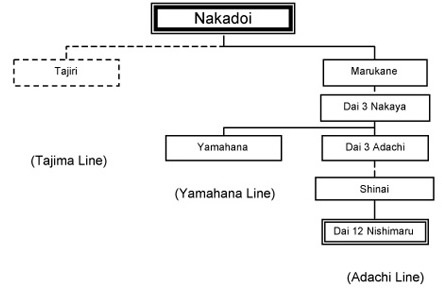 Another important Okayama line is the “Nakaya Line” originated from Dai 3 Nakaya, which incorporates “Nakadoi Line” (Hyogo) sire influence and Dai 13 Hanayama dam genetics. Dai 3 Nakaya sired Dai 3 Adachi in the foundation of the modern “Adachi Line”, leading to “Shinai”, “ Takaniwa” and “Dai 12 Nichimaru”. Dai 3 Adachi progeny are renowned for strong growth and exceptional daily gain. In modern Japanese breeding, the role of the Okayama bloodline (to a greater extent than Kedaka/Tottori) is in the development of superior cow herds. Within the most popular sires listing for 2007, there is no significant Okayama-line representative. In terms of 2007 national herd registrations, Okayama fielded just six bulls of 886. Even within Okayama Prefecture, Modern (Shimane) Itozakura bloodlines are used in cow herd development, Kedaka lines in sire selection. Most of the benefits identified in relation to Kedaka/Tottori bloodlines in Australian Wagyu breeding also apply to Okayama bloodlines – these include early maturity, growth/yield, fertility, milking ability and acceptable meat quality outcomes. Similarly, marbling results from cross-breeding will most likely be less than for high Tajima joining, but growth and yield can compensate. Okayama tsuru bloodlines are scant in Australia, however the Okayama heritage (from the Fujiyoshi line) lives on in the Modern Itozakura line, originating in Shimane Prefecture, with the birth of Dai 7 Itozakura. Numerous current Itozakura sires can be traced to Okayama through this pedigree. The Adachi line is represented in the progeny of “Sawafuji” (PEDFAY70) – a base female line of Westholme breeding.